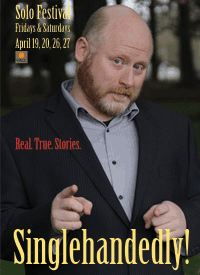 Portland Story Theater’s “Singlehandedly” Solo Works Festival! If anyone out there has done public speaking, you know how much bravery it takes to tell a story to a room full of strangers. Being able to engage an audience with nothing more than a good story is challenging enough, but digging deep into your own experience, taking an audience of strangers with you on a personal journey and helping them to feel what you experienced, that takes some serious talent. This weekend Portland Story Theater is presenting four days of solo storytelling in “Singlehandedly,” the world’s only festival with a focus on long-form, personal narratives. Every night listeners will be treated to new works presented by some of the Northwest’s most compelling storytellers. Audiences will get up close and personal in the intimate Hipbone Studio as the artists delight them with real, true stories. While the focus is on local talent, there will be a special, nationally-acclaimed guest artist-in-residence: Annie La Ganga. The whole thing kicks off this Friday, April 19 with Lawrence Howard and Kriya Kaping. Followed by Lynne Duddy herself alongside Brad Fortier on Saturday, April 20. Next weekend will feature the co-founder and singer/accordionist of Portland-based cabaret band Vagabond Opera, Eric Stern and Annie Rosen on Friday, April 26 and Penny Walter and artist-in-residence Annie La Ganga on Saturday, April 27. You can pick up individual tickets by clicking on the dates above or purchase full festival passes here. “Singlehandedly” is certain to display the breadth of talent and the rich complexity of each individual performer as they bring their own personal experiences to the stage, collectively creating a beautiful collage about the human experience. Don’t miss it Portland! Tags: Annie La Ganga, Annie Rosen, Brad Fortier, Eric Stern, Hipbone Studio, Kriya Kaping, Lawrence Howard, Lynne Duddy, Penny Walter, Portland Story Theater, Singlehandedly, Vagabond Opera.